By Nicole Triebe of Windy City Dinner Fairy. I LOVE a good theme party. It gives your party that extra fun touch and I love seeing what my friends will come up with for costumes. We recently attended a wig party for a friend’s birthday and it was a blast! This year, I’m going to ask my friends to dig out their prettiest tropical sundresses and Hawaiian shirts for some Polynesian-themed revelry at my end-of-summer Luau. Scroll down below to see how I’m planning on pulling it all together, and get some inspiration for your next party! The idea to throw this end-of-summer Luau came about while browsing the aisles of my neighborhood party store. I have a slight addiction to food photography props, and now that’s expanded to party decor. Now that we have a beautiful house and a decent sized yard, I’m always wanting to invite all of our friends over to show off my hosting skills. 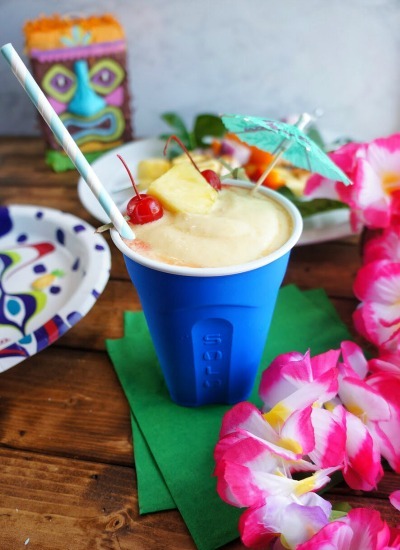 I’ve always wanted to throw a luau-style party, and since luaus are all about the fun tropical punch drinks, it was a perfect match! After coming up with some summer-time mocktails for the kids in my last post, my mind couldn’t help but think about spiking those for the adults for our own fun. My mind immediately went to the classic Piña colada. Nothing compares to that creamy frozen fruity beverage during the hot summer months, am I right? Since Allison is a huge mango fan, I put a mango twist on this classic cocktail for our Luau. Place the mango cubes, ice, sugar, pineapple juice, cream, and coconut milk into a blender. Puree until smooth, pour into glasses and serve. This frozen treat is going to be my signature cocktail at the party bar. Served in Solo’s Blue Plastic Party cups. I like to think about complimentary colors when planning anything styled, and the beautiful yellow orange color of this delicious mango cocktail. If you look at the color wheel when planning out complimentary colors, you can take the color of the drink (orange) and look directly across the color wheel to find it’s complimentary color. In this case, blue fit the bill! Luckily, Solo’s party cups come in a beautiful blue color. I garnished my drinks with a skewer of maraschino cherries and a pineapple wedge and a cocktail umbrella for an extra special touch. 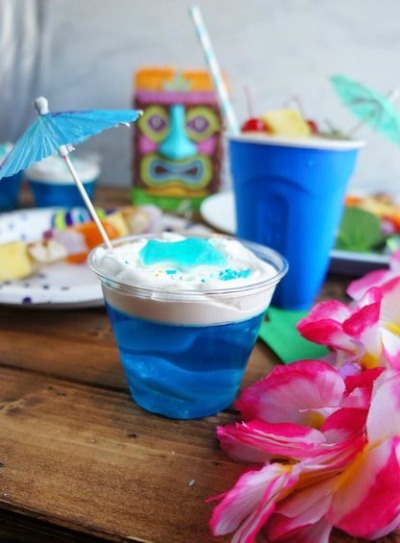 For additional beverages at the Luau, I’m planning on having served the punches in a mix of punch bowls and beverage dispensers with cups, ice, cocktail umbrellas, and garnishes on the side for DIY serving. It’s such a relaxed and low-key way to host a party because it allows guests to help themselves while I can focus on food and greeting guests. Sweet and sour chicken kabobs are super fun for guests, and have so many colors that fit perfectly with the theme, not to mention they’re incredibly delicious! 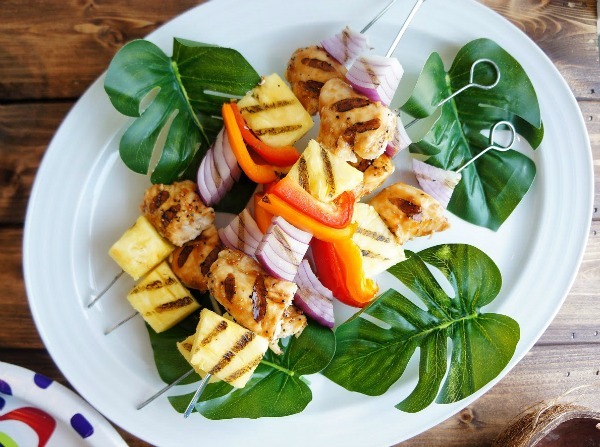 The sweetness of the pineapple pairs so well with the sour chicken, and they’re grilled, so your guests can feel less guilty when they have an extra serving! They’re also easy to assemble and throw on the grill, so you can focus your attention on everything else at the party. 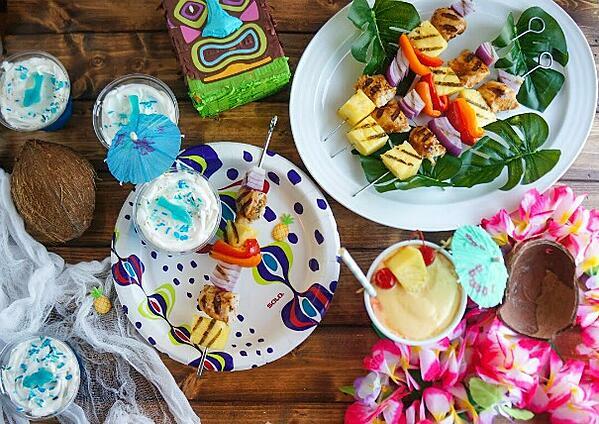 After grilling and assembling the skewers, I plated them for my guests on Solo’s fun 7″ paper plates with this super fun design for summer. Again, the colors go right along with the theme, almost like they were made for this party! 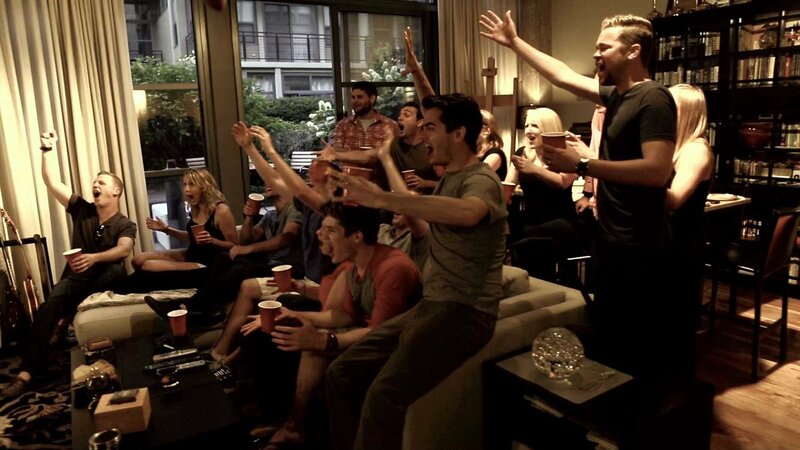 For any party, don’t feel like you have to spend a lot of money buying fancy decorations! Leis and flower necklaces for your guests are a must for any luau and they’re so inexpensive! I grabbed this tiki pinata for an extra fun for the kids. My absolute favorite decorative touch is natural tropical fruits. Pineapples, coconuts, bananas, and other tropical fruits make amazing natural and affordable decorations. You’re already using pineapple on your skewer, so grab an extra one for a fun table centerpiece! They also smell amazing, which is an added bonus! As a sweet treat for the kids, I made these adorable shark bite shooters. Using Solo’s 9 oz clear plastic cup, I filled them with blue jello and inserted shark gummies to look like they were “swimming” in the jello. After my jello was firm, I topped each cup with some cool whip and another shark gummy. These were such a hit with my nieces! Love this post? Be sure to check out our other summer party ideas!